A rapidly advancing crack in Antarctica’s fourth-largest ice shelf has scientists concerned that it is getting close to a full break. The rift has accelerated this year in an area already vulnerable to warming temperatures. Since December, the crack has grown by the length of about five football fields each day. The crack in Larsen C now reaches over 100 miles in length, and some parts of it are as wide as two miles. The tip of the rift is currently only about 20 miles from reaching the other end of the ice shelf. Ice shelves, which form through runoff from glaciers, float in water and provide structural support to the glaciers that rest on land. When an ice shelf collapses, the glaciers behind it can accelerate toward the ocean. Higher temperatures in the region are also helping to further the ice shelf’s retreat. If the ice shelf breaks at the crack, Larsen C will be at its smallest size ever recorded. 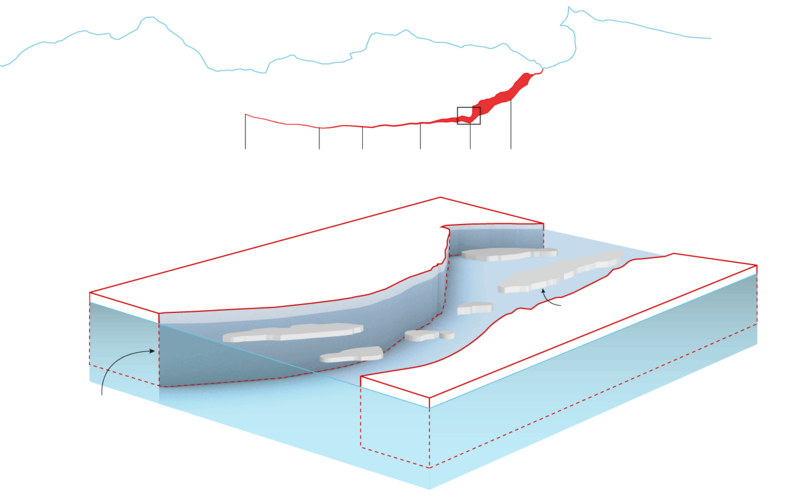 That would also leave the ice front much closer to the ice shelf’s compressive arch, a line that scientists say is critical for structural support. If the front retreats past that line, scientists say, the northernmost part of the shelf could collapse within months. 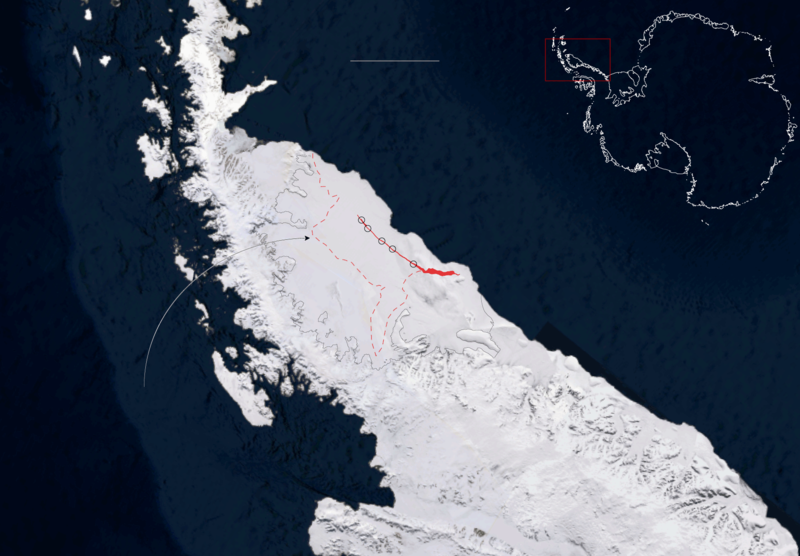 It could also significantly change the landscape of the Antarctic peninsula. to the bottom of the ice shelf. The crack in Larsen C is a third of a mile deep, down to the floor of the ice shelf. points will be lost as the shelf retreats. According to Dr. Rignot, the stability of the whole ice shelf is threatened. Ice rises are islands that are overriden by the ice shelf, allowing them to shoulder more support of the shelf. Scientists have yet to determine the extent of thinning around the Bawden and Gipps ice rises, though Dr. Rignot noted that the Bawden ice rise was a much more vulnerable anchor. other vulnerable ice shelves will. The Larsen A and B ice shelves disintegrated in 1995 and 2002, though both were drastically smaller than Larsen C. Neither contributed significantly to global sea level rise, however, because they were already floating above water, and the glaciers behind them did not contain a substantial volume of ice. According to Dr. Rignot, the collapse of Larsen C would add only a tiny amount of water to the global sea level. Of greater concern to scientists is how the collapse of ice shelves can affect the glaciers that flow behind them, because the melting of those glaciers can cause much higher levels of ocean rise. 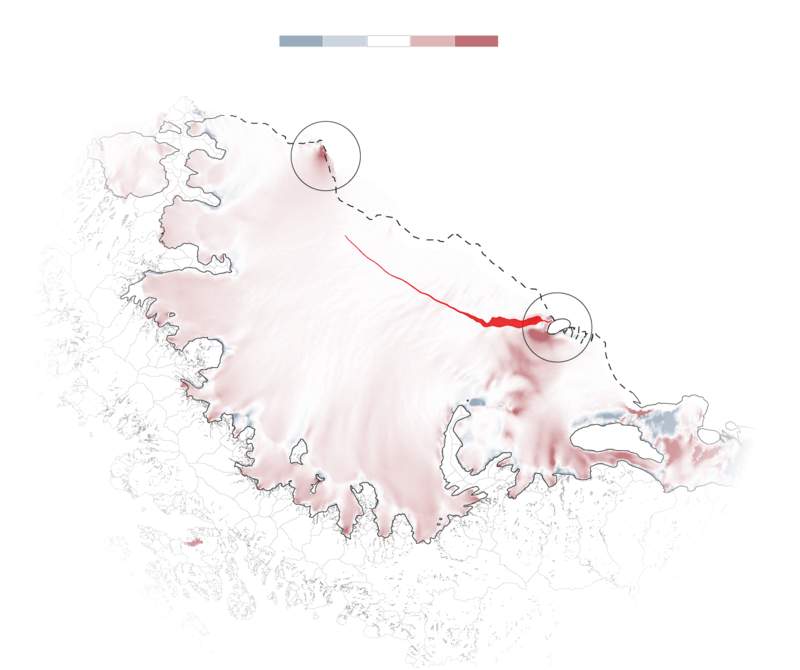 Scientists see the impending Larsen C collapse as a warning that much larger amounts of ice in West Antarctica could be vulnerable.